Often derided for its infighting or dismissed as irrelevant, Syria’s political opposition reflects the contradictions and conflicting geopolitical interests upon which it was founded. 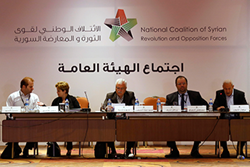 In its latest report, Anything But Politics: The State of Syria’s Political Opposition, the International Crisis Group examines the challenges facing anti-Assad political forces, notably the National Coalition of Syrian Revolutionary and Opposition Forces (the Coalition). That its leaders have failed to overcome the Coalition’s internal weakness partly explains their lack of influence within the overall opposition. But so too does their Western and Arab allies’ failure to address the ways in which their own mixed signals, independent agendas and poor coordination have undermined the structures they seek to empower. Creation of an alternative political grouping is always tempting but unlikely to yield markedly different results. The focus should be on realistic changes that take account of present circumstances. The opposition’s foreign state backers should drastically improve their coordination, especially on the military front, where disorder has proved most damaging. This should be accompanied by efforts to limit alternative channels of material and logistical support; notably, Gulf states need to rein in private funding, and Turkey needs to do more to disrupt the influx of foreign jihadi fighters and fundraisers across its southern border. The most effective way for the Coalition to enhance its relevance on the ground is to seek a direct role in providing basic services in rebel-controlled areas. This requires cooperation from main-stream rebel groups that the opposition’s main foreign backers should work to secure. The Coalition and its backers need to develop an effective strategy to deal with the urgent threat posed by jihadi groups. Besides progress in the above realms, this necessitates enhancing civil society initiatives and activist networks. Its qualms regarding the Geneva II process notwithstanding, the Coalition should develop a realistic strategy towards what remains the best hope for ending the war. This should entail, for example, reaching internal consensus on workable negotiation parameters. “The Coalition has become locked in a cycle of misunderstanding and frustration with Washington, the most important of its Western allies”, says Noah Bonsey, Senior Syria Analyst. “Though both share the goal of a Syria without Assad, neither has developed a strategy that takes sufficiently into account the constraints of the other, including growing American risk aversion”. “Any viable resolution of the war requires a representative opposition”, says Peter Harling, Project Director for Syria, Iraq and Lebanon. “But to endlessly search for a more credible and coherent political opposition is to mistake cause and consequence: only a political process viewed as credible and coherent by the opposition’s base will produce viable representatives – not the other way around”.